In an edi­to­ri­al I lead you through con­fu­si­on and puz­zle­ment of lin­gu­is­tic expres­si­ons and sup­port you in the suc­cess of your text by crea­ting pro­fes­sio­nal docu­ments. In order for a trans­la­ti­on to repro­du­ce in the tar­get lan­guage exac­t­ly the mea­ning of a given source text, in addi­ti­on to proofrea­ding an edi­to­ri­al is often use­ful and necessa­ry. This inclu­des a cor­rec­tion of the trans­la­ti­ons with respect to a mea­ning­ful and cor­rect repro­duc­tion of the ori­gi­nal text and a check of the com­ple­teness and cor­rec­t­ness of the trans­la­ti­on. Chan­ges that are car­ri­ed out as part of an edi­to­ri­al are done wit­hin the text docu­ments and are mar­ked as such. For Micro­soft Office and Open­Of­fice docu­ments this is done by the so-cal­­led tracking mode. Using this tracking mode edi­to­ri­al chan­ges made by the trans­la­tor are color-coded and com­men­ted for your infor­ma­ti­on. Sty­listic revi­si­ons inclu­de impro­ve­ments for word repe­ti­ti­ons, mis­lea­ding phra­sing, sen­tence struc­tu­re, mea­ningless fil­ler words and much more insuf­fi­ci­en­ci­es which ham­per the flow of the text rea­ding. Again, I work direc­t­ly in your text file so you can see and under­stand all the cor­rec­tions and sty­listic revi­si­ons done by the edi­to­ri­al. In addi­ti­on to the proofrea­ding tasks such as eli­mi­na­ti­on of ortho­gra­phic, gram­ma­ti­cal and syn­tac­ti­cal errors, I review the fide­li­ty of the trans­la­ti­on to the source text, the adhe­rence to ter­mi­no­lo­gy word­ing and the adap­tati­on of the lin­gu­is­tic style. All of this is done, if pos­si­ble, wit­hout inter­fe­ring with your per­so­nal style. Spel­ling and punc­tua­ti­on are not ever­ything that makes your text per­fect. Is a table of con­tents com­ple­te and do head­lines match? Do gra­phics, tables, and other style ele­ments fol­low the same pat­tern? Is the glossa­ry com­ple­te and sor­ted? For all the­se ques­ti­ons I can give you ans­wers in the con­text of a review. The edi­t­ing of PDF files is tech­ni­cal­ly not always use­ful. The capa­bi­li­ties of a PDF Edi­tor soft­ware are not iden­ti­cal to tho­se of a stan­dard word pro­ces­sing pro­gram. For examp­le, the abi­li­ty to edit PDF docu­ments for cus­to­mi­zing para­graphs or chan­ging lay­outs is limi­ted. The­re­fo­re exten­si­ve edi­t­ing works in text docu­ments with word pro­ces­sing pro­grams such as Micro­soft Office or Open­Of­fice are much more fea­si­ble com­pa­red to tho­se of PDF docu­ments edi­ted with PDF Edi­tor soft­ware. Stan­dard text file with exten­si­on txt in uni­code cha­rac­ter set for­mat. Micro­soft file up to Office 2003 with exten­si­on doc, xls or ppt (Word, Excel or Power­Point). Ado­be Por­ta­ble Docu­ment For­mat (PDF) file with exten­si­on pdf. 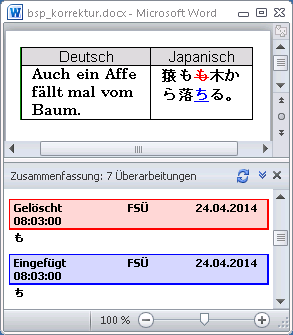 Open­Of­fice file ending with odt, ods or odp (Wri­ter, Calc or Impress). Micro­soft Office 2007 file with exten­si­on docx, xlsx or pptx (Word, Excel or Power­Point). Plea­se con­tact us if your text is stored in files using other file for­mats. To cal­cu­la­te the cost of edi­to­ri­al tasks the word count of the text is used. This amount of words is deter­mi­ned using the soft­ware Ome­gaT and then mul­ti­plied by the edi­to­ri­al word pri­ce of 0.08 Euro which gives as a result the pri­ce for the edi­to­ri­al of the text. If a word count deter­mi­na­ti­on by Ome­gaT is not pos­si­ble the word count is cal­cu­la­ted by other soft­ware pro­grams or deter­mi­ned as an esti­ma­te.